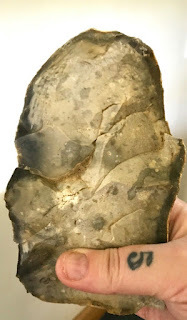 Hefty, flint-struck Palaeolithic hand axe/chopper (East Anglia, UK). Worked flint, sharp edged, just lovely. Beautifully balanced ancient hand axe/chopper. length: 160mm, width: 100mm, weight: 600g approx. HIGHLY UNUSUAL left-handed Early paleolithic flint hand axe (UK). Worked flint, sharp edged, just lovely. This ancient tool has surely been made for use by a left-handed person. I discovered this when I first picked it up; being left-handed, my fingers sit in the grooves perfectly. Beautifully balanced Palaeolithic cordate hand axe. length: 180mm, width (widest point): 130mm, tapering to 70mm. weight: 650g approx. And its just a stone and any 'grooves' are natural. Whether or not it sits comfortably in his grubby hand, it is not a palaeolithic tool. Item specifics Colour: Various, Material: Stone/Flint, Type: Tools, AMAZING NEOLITHIC HAND TOOLS STONE AGE/PREHISTORIC TOOLS. Beautiful hand-worked scrapers and cutters from Paleolithic/Neolithic Period. Found within 10 miles of Sutton Hoo burial grounds. 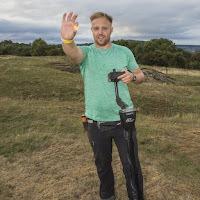 Four years after finding a new hobby, Gareth Millward was about to experience the same rush felt by many explorers and metal detectorists before him - the discovery of "treasure". 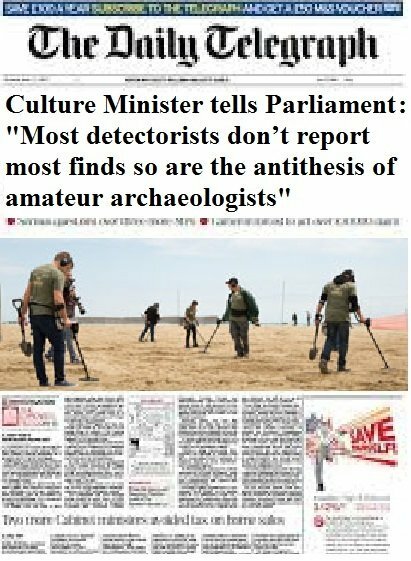 As a result, the British public get subjected to yet another unreflective puff-piece totally ignoring whole aspects of Collection-Driven Exploitation of the Archaeological Record, including the fact that the artefact hunter was searching undisturbed pasture ('What is it like to strike rich while metal detecting?' - BBC News 20th April 2019). Indeed, the photo showing him triumphantly displaying his trophy shows not only pasture, but what look like earthworks. 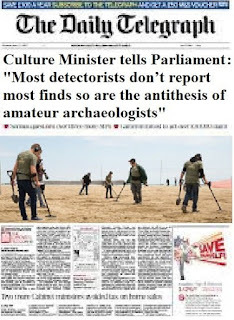 What a shame an opportunity was missed to highlight this aspect of irresponsible use of a metal detector and private finders just pocketing the archaeological evidence from the trashing of yet another site in the Collection-Driven Exploitation of the archaeological record. Mr Millward hopes to carry on pl[under]ing the same secret plot for treasure - and it isn't the prospect of financial failure he fears. He said: "What I dread is going back and seeing every man and his dog with a metal detector in my field." Oh, so he bought the field then? Alastair Willis, finds officer for Derbyshire and Nottinghamshire [...] encouraged amateur detectorists to avoid digging into unploughed fields. 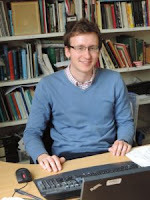 "If you're on ploughed land, you're not disturbing the evidence that archaeologists need to date the material," he said. I sincerely hope he did not and was misquoted. The 'material' IS the evidence, especially in the case of a surface site. Taking it away randomly to add to a private collection destroys sites, such the Willis quote is object-centric and totally ignores the aspect of site conservation. But what this FLO-quote fails to reveal is that the record he himself wrote (DENO C5A99E) states quite clearly: Method of discovery: Metal detector General landuse: Grassland, Heathland Specific landuse: Undisturbed grassland - so 37-year old Gareth Millward was not doing it by the book, and was flouting the Code of Responsible Metal Detecting in England and Wales - it is a shame the FLO is not quoted as saying so in the article. When will UK archaeologists start telling it like it is instead of their wishful-thinking dumbdown lies? 2019 - 04 - 15 I am concerned over the number of Lithics (stone tools and implements) offered for sale via ebay that are not as they are being claimed by the vendors. 11:04:57 UTC Pradnya Welcome to eBay Live Help, my name is Pradnya. 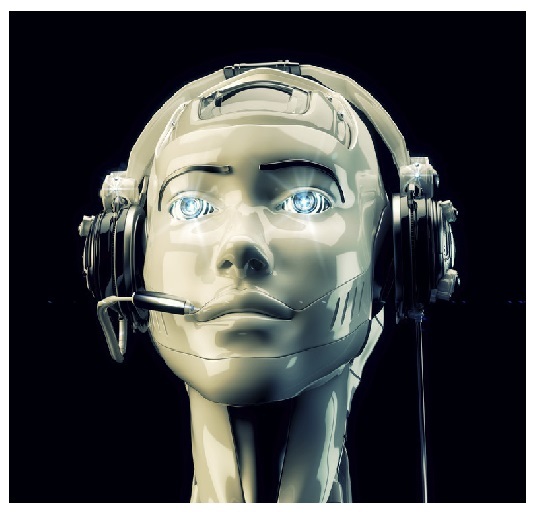 I would be happy to help you today. 11:07:07 UTC Pradnya In this case I would need to connect you to our dedicated team who looks into such cases. May I go ahead and connect you to them right away? 11:07:32 UTC Pradnya Please be connected, while I am transferring this chat to our relevant team. Stone Age, Axe Tool, Hand Made, Ancient Neolithic, Anthropomorphic Wood Handle, Nice? 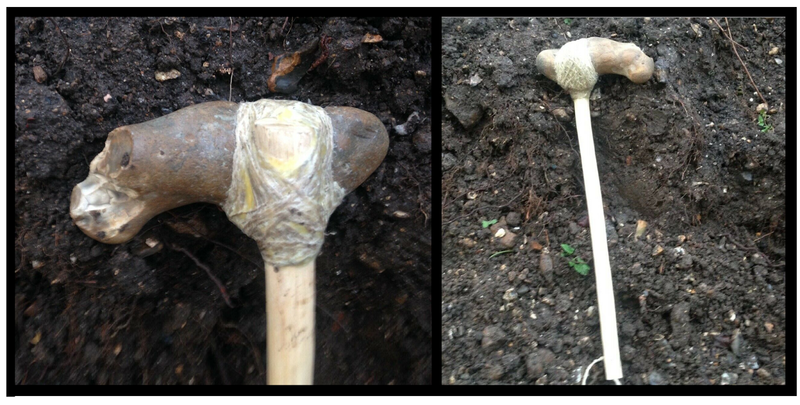 Stone Age Axe Tool, Hand Made Ancient, Neolithic Anthropomorphic, Wood Handle, Nice? Stone Age Axe, Tool Hand Made, Ancient Neolithic Anthropomorphic, Wood Handle, Nice? Stone Age Axe Tool, Hand Made, Ancient Neolithic, Anthropomorphic Wood Handle, Nice? So, anyway what here is "ancient"? Well, a stone. A simple knobbly stone. So what is "Neolithic"? Well, nothing. What is 'hand made'? Some fool has wound a bit of bandage round a knobbly stone and stick and is trying, it seems, to sell this as a 'Stone Age Axe Tool'. I would even question whether the adjective 'nice' is correctly applied to this flimsy farcical travesty. The asking price for this junk archaeology is not a nice prospect, the metal detectorist (as many of them do) has an inflated idea of how much it is worth, treasureboxpeace wants £199.99 Buy it now - for this piece of nonsense. Where's the FLO when you need one? This is not even 'Ladybird Book Archaeology' this is sheer nonsense - two hundred quid's worth of nonsense. In the past this guy has sold off 'Solid Silver Job Lot 155g Metal Detector Detecting Finds Coins Rings + Scrap ' £229.99 (Oh?) [that 'scrap' by the way contains at least three Roman coins, they may not be 'collectable' but they are still archaeological artefacts] also '18k + 9k Gold And Silver Lot Metal Detector Detecting Finds Coins Bars Ear Rings (#162611570468)' £69.99, a 'Silver Ring Medieval Style Nice Metal Detector Detecting Finds (#162531038405)' ££59.99 plus lots of other people's rings and lost jewellery, and many groups of metal detecting finds (such as: 'Metal Detector Detecting Finds Big Lot, Artefacts, Romans, Some Silver Coins (#162421305006) £22.00', so what kind of 'only intrestid in th' 'istry, ain't innit fer the munny' kind of citizenly archaeology is this then?). Perhaps in order to protect their customers, eBay ought to insist on ancient artefacts (I use the term loosely) from the UK are - since there are such bodies - reported to the PAS or Treasure Unit of Scotland and are accompanied by a PAS database number and/or printed reports signed by an FLO, because this (sent me by a reader) is ridiculous. The British artefact hunters selling 'artefacts' they have found have either a real nerve or are just completely ignorant of what they are writing about. 'Citizen archaeologists' indeed! Obviously self-written 'identifications' by the artefact hunters of the UK are worth about as much as a wet paper bag. A seller known as 'alchemistwhitbyjet' (1320 location: Guisborough, United Kingdom)offers - alongside what he identifies as pieces of Whitby jet - a 'Collection Of Stone Age Tools/artefacts From North East UK, arrow and spear points scrapers mini axe and what looks to be maybe a Drawblade' (the latter is the turd-shaped one at the top) . At the moment the price is etc £9.99 and there is already one bid (!) These are just stones. All of them, the guy has no idea at all what he's looking at - so what value his identification of 'Whitby jet'? 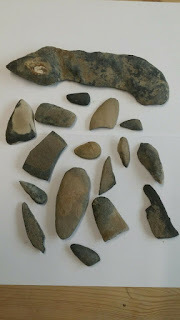 So a stone that is a bit pointy is seen by him as a 'tool', or a projectile point (small pointy stone = arrowhead, big pointy stone = spearhead, simples), the not very pointy ones must be 'scrapers', one that's sort of rectangularish , obviously, must be an 'ancient axe' and if it has the shape of a dog turd, well it's obvious it must be a 'drawknife' [my bet is this self-proclaimed 'alchemist' has never used a drawknife or spokeshave in his/her life]. 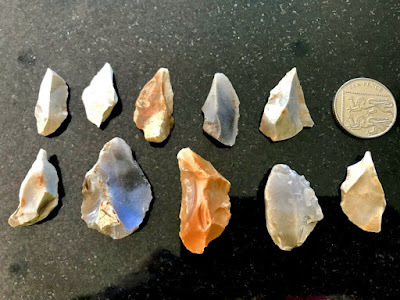 I am also going to guess that they've never seen a flint-knapper at work, or held a knapped stone tool in their hand - because if they had, they would not be mistaking these objects as tools made by human agency. So, by the same token, does he call all black and slightly shiny stones 'jet'? 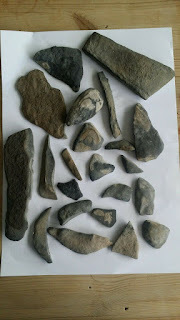 The same seller also proffers: a Collection Of Stone Age Tools From Cleveland Hills Nr Guisborough... well, guess what? These ones have been shaped by water erosion (!) 'The hidden knowledge of the ancients' no doubt. And when is the PAS going to step in and offer a bit of that public education they promised? What a ridiculous situation.